It’s spring here in Michigan. The leaves from the spring flowers are bursting up through their winter sleeping place to greet the sunny, longer days. There’s a chill in the air. But I can just tell warmer coatless days are ahead and I am getting all itchy to throw off the jacket and run barefoot through the grass. But first. There is this. This absolutely delightful Crochet Houndstooth Hat. Sure. She’s a pretty thing. But what I really love best is how this feels on my head. Warm, but light. Just the right amount of softness. It moves like your favorite swirly dress. And when you put it on it just makes you feel wonderful. And the hat looks so smart you look pretty wonderful too. Let’s talk about the yarn that totally makes this Houndstooth Hat. It’s made with Chic Sheep yarn, a 100% merino wool that is very affordable and available at “big box” stores like Joann, Michael’s and Hobby Lobby. You can also pick it up on Amazon right here. If I lost you at “100% wool” and you’re thinking… “uh.. no.. I can’t.. I will itch..” Think again. This is merino wool. It is crazy soft and has been treated so you can machine wash it. Which makes it completely win-win. So even if you think you just can’t… pick up a skein and give it a try. I bet you will be surprised at how amazing it is. Plus it is such a treat to be able to get such a high quality wool yarn outside of a specialty local yarn shop. And Houndstooth. Sigh. What is it about houndstooth that is just so, so special? You might remember I wrote a blog post about the crochet houndstooth pattern last year, which you can read right here. 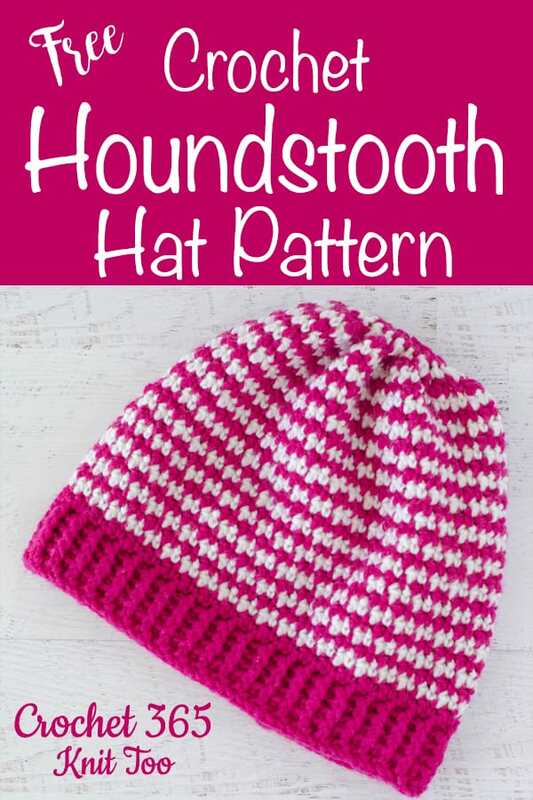 I love the houndstooth pattern because it is so easy. The look is achieved by alternating colors and double crochet and single crochet stitches. In one row you start with a double crochet, then a single and so on. Then in the next row, you start with a sc worked over the previous row’s double crochet, etc. It is a fun way to achieve a very cute look. When changing color, just drop the color and pick it up again on the next row. Easy peasy. To start this hat, I used a foundation half double crochet stitch. In this technique you form the starting chain at the same time as the 1st row of half double crochet. My friend Lindsey at Winding Road Crochet has a great tutorial you can watch here. 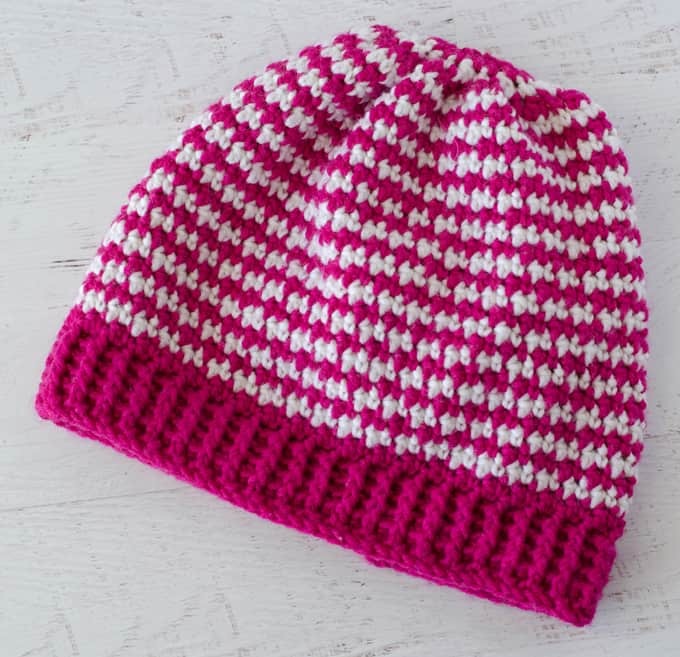 I like the foundation half double crochet because it makes the start of this houndstooth hat very stretchy–just what you need for a hat, right? 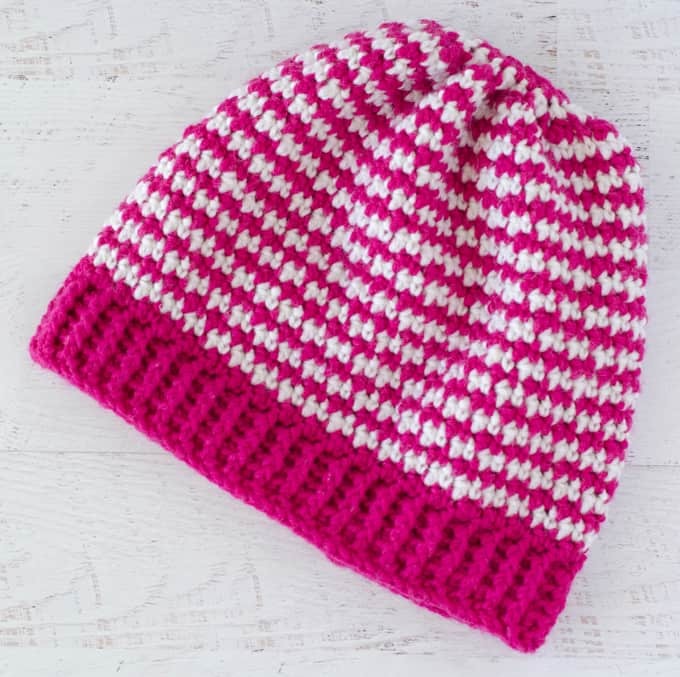 This hat starts at the brim with a row of foundation half double crochet stitches. If you are unfamiliar with the technique, Lindsey at Winding Road Crochet has a great tutorial you can watch here. Alternatively you can choose to chain and work a row of hdc in place of the foundation hdc row. R1: With pink yarn, work 84 foundation hdc. At end of row, join with a slip stitch. (84 st) Note when you join, you will notice that only the top part of your stitches are joined. Don’t worry. We’ll weave together that bottom bit at the end. R3-7: ch 3, *front post hdc in next st, back post hdc in next st* repeat * to * around. Join to 1stst. With next row, begin Houndstooth pattern as described. Note that the starting chains of each row DO NOT count as a stitch. When changing colors, drop old color and carry yarn up back of work (do not cut yarn). R33: With white, ch 1 and starting in the same spot as ch, *sc next 2 st together, dc next 2 st together. Repeat from * around. Join with sl st to top of 1stsc. (21 st). R34: With Pink, ch2 (NOT 1ststitch) and starting in the same spot as ch, *dc 2 together. Repeat from * around, work dc in last stitch, join with sl st to top of 1stdc. (11 st). Fasten off yarn leaving a long strand. Thread a tapestry needle with this strand and weave through top of last row and cinch closed. Knot off and weave in ends on the wrong side of work. Take starting strand and carefully close the bottom of the 1ststitch to the last stitch of the foundation hdc row at the start of the hat. Then weave in ends. 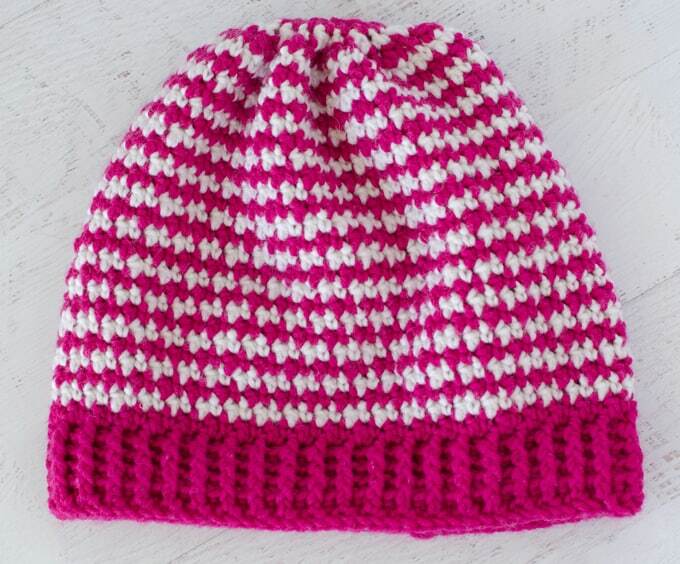 Purchase an ad-free printable version of the Crochet Houndstooth Hat pattern here! I love seeing your finished projects! If you enjoyed making the Crochet Houndstooth Hat, I’d love to see yours on Instagram, be sure to tag me @crochet365knittoo. If you are on Facebook, stop over to the Crochet 365 Knit Too Facebook page or pop over to the Crochet365KnitToo Club and share a photo! I’d love to see your work! Written pattern copyright Cheryl Bennett 2019, all rights reserved. Please do not reprint or repost this pattern. 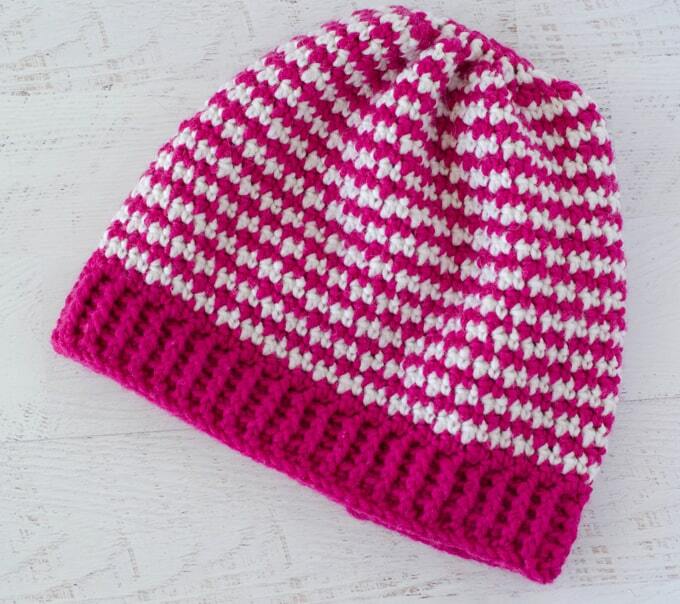 If you would like to share this Crochet Houndstooth Hat with others, just link to this page. If you’d like to make items for sale from this pattern, please visit my About page for more information.